All eyes are on two key senators after Supreme Court nominee Brett Kavanaugh narrowly cleared a critical procedural hurdle on Friday that advances his nomination to a planned final vote Saturday. As of early Friday afternoon, Sen. Susan Collins, R-Maine, and Sen. Joe Manchin, D-W.Va., had not yet indicated publicly whether they plan to support Kavanaugh in the final vote, leaving his fate unclear. The pair voted "yes" on Friday's procedural measure, but that doesn't mean they will vote the same way for the full vote on Saturday. It appears at least one of their votes will be needed in order for Kavanaugh to be confirmed. Collins is expected to announce her decision in a speech on the Senate floor at 3:00 p.m. ET on Friday. 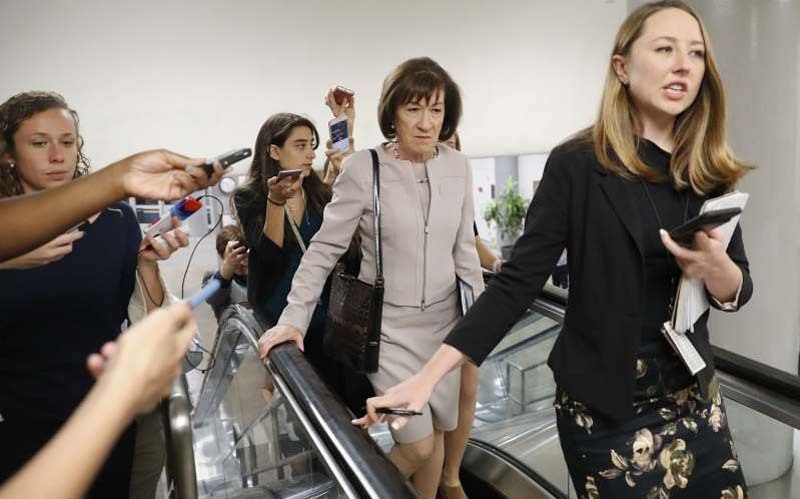 She previously said Thursday that she felt that the supplemental FBI investigation, which probed the allegations of sexual misconduct against Kavanaugh, was "very thorough." Meanwhile, Manchin has not said how he plans to vote Saturday. A small handful of lawmakers — Collins, Manchin, Sen. Jeff Flake, R-Ariz., and Sen. Lisa Murkowski, R-Alaska — had been considered potential swing votes on Kavanaugh up until Friday morning. But Flake, who voted "yes" to advance Kavanaugh's nomination, told reporters that he planned to vote to confirm Kavanaugh on Saturday unless something big changes. Murkowski, however, voted against the motion to move forward Friday morning, later calling the cloture vote "a mistake." Later, she indicated that she would stick to her decision to vote "no" on Kavanaugh. She told reporters Friday that it was "truly the most difficult evaluation of a decision that I've ever had to make." "I have been wrestling with whether or not this was about the qualifications of a good man or is this bigger than the nominee. And I believe we are dealing with issues right now that are bigger than a nominee," she said. "I believe that Brett Kavanaugh is a good man, I believe that he is a good man, it just may be that in my view, he's not the right man for the court at this time." Republicans need at least 50 votes to confirm Kavanaugh on Saturday, because Vice President Mike Pence could break a tie and get the nominee over the threshold. Republicans control 51 seats in the chamber, meaning they can't afford to lose more than one vote, if all Democrats vote against Kavanaugh. With Murkowski a "no" and Flake a "yes" on Saturday on Saturday, that would mean they can't afford to lose Collins — should Manchin joins all other Democrats in voting against Kavanaugh. But if Manchin, a red-state Democrat, joins Republicans in voting to confirm Kavanaugh, Republicans can afford to lose Collins. In other words, for Kavanaugh's nomination to be defeated, both Collins and Manchin would have to vote "no."